Pastor Jerome Liberty said his assignment in Port Elizabeth is to raise end-time financiers. People who finance the advancement of the Gospel into the nations. He believes that this is the time to give birth to that which God has placed inside of us so that nations may be edified and the Kingdom of God might be advanced. Every year the body of Christ at large wait in anticipation for the annual Restoration Conference hosted by Victory Ministries International. There is always a fresh word to push God’s people to the next level. 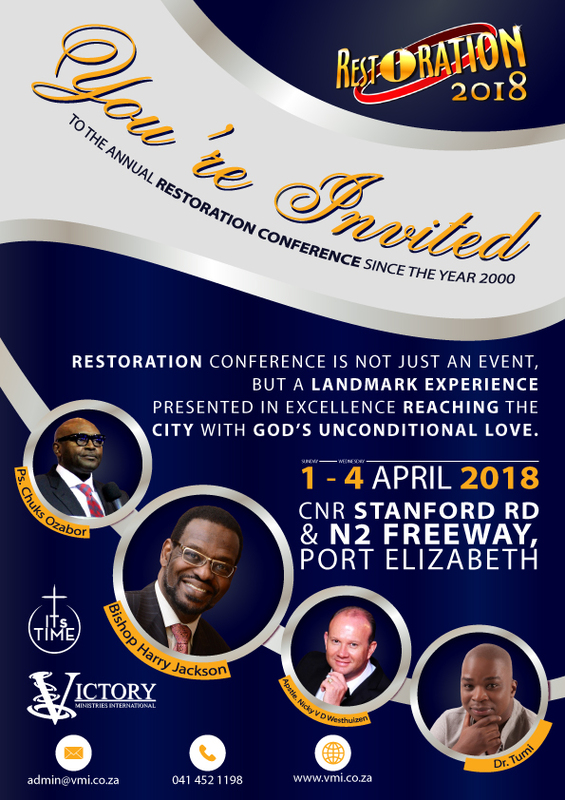 Since the first Restoration Conference held in 2000, gifted international speakers such as Dr Creflo Dollar, Bishop Harry Jackson, Pastor Michael Pitts, Dr Mensa Otabil, Dr Pat Francis, Bishop Tudor Bismark, Pastor Tommy Tenney, Dr Greg Powe, Apostle Nicky van der Westhuizen, Dr Alan Bagg, and Prophet Ed Traut have graced the podium at Restoration Conferences. This basic concept of restoration is to cause to turn back, a returning, a making whole again, to be complete. This concept is used often in the early part of what we call the Old Testament in regard to people, livestock, and possessions. True to those words spoken, Restoration 2018 from the 1st to the 4th of April is coming with powerful messages of restoration, a new vibe, and a freshness of its own.